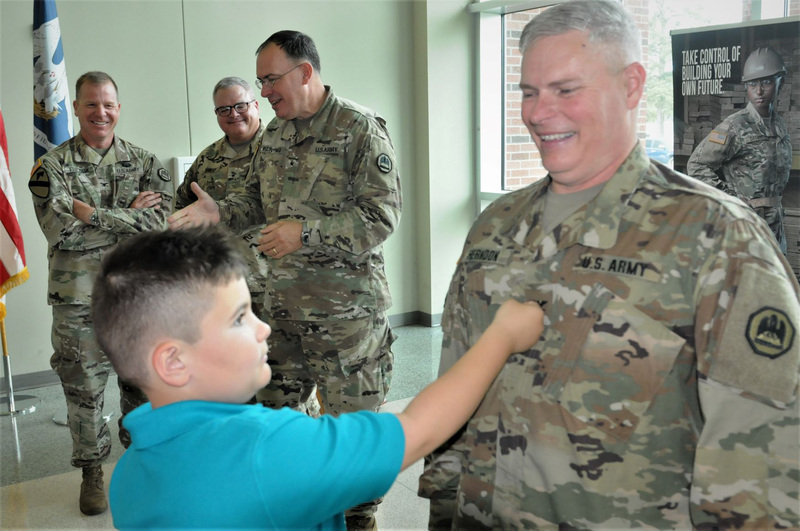 NEW ORLEANS – Louisiana National Guardsman Robert “Chad” Herndon was promoted to the rank of colonel during an official ceremony at Camp Beauregard in Pineville, April 7. 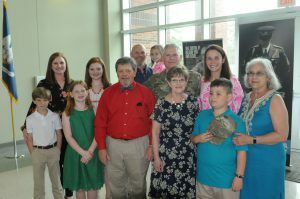 Herndon, a native of Tupelo, Mississippi, and a graduate of Bastrop High School in Bastrop, Louisiana, was pinned by his wife and son as family, friends and fellow National Guardsmen looked on. 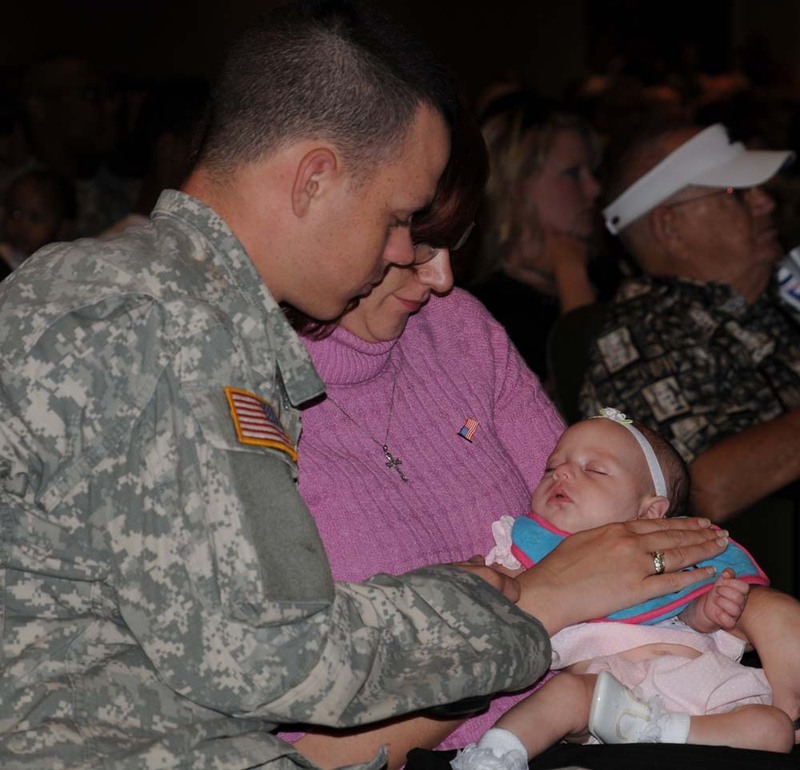 Herndon enlisted in the LANG’s 528th Engineer Battalion as a combat medical specialist in 1990. 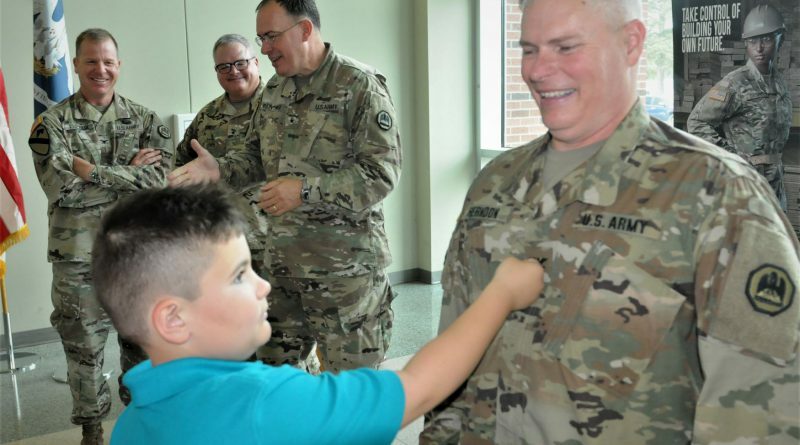 After serving as an enlisted Soldier for two years, he attended the LANG’s Officer Candidate School class number 32 at Camp Beauregard and was commissioned a second lieutenant in 1992. His first position as an officer was as a platoon leader in the 528th. Herndon held multiple key roles in the LANG as he worked his way through the ranks. 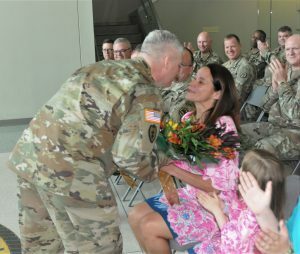 During his deployment to Kandahar, Afghanistan in support of Operation Enduring Freedom, he was the signal officer in Headquarters and Headquarters Company, 528th Engineer Battalion and assumed the role of operation planning officer in charge of coordination with all aviation assets as related to his battalion. Stateside, Herndon has supported relief efforts after Hurricanes Katrina, Rita, Gustav, Ike, and Isaac; the Deepwater Horizon oil spill; and Operation River Guardian. From 2014-2017, Herndon commanded the 205th Engineer Battalion, headquartered in Bogalusa. Following his command, he transferred to Joint Force Headquarters and assumed the role of division chief of innovative readiness training, where he coordinated withl ocal governments and parishes throughout the state to use annual training time to implement community construction projects. He is currently the LANG’s deputy director of plans, training and operations. Herndon holds a Bachelor of Business Administration, Major Marketing, from the University of Louisiana at Monroe and is a co-owner of a program management consulting firm in Baton Rouge. Herndon’s awards and decorations include: the Meritorious Service Medal with 2 oak leaf clusters, Army Commendation Medal with 3 clusters, Army Achievement Medal, Army Reserve Component Achievement Medal with silver oak leaf cluster, National Defense Service Medal with star, Armed Forces Service Medal, Global War on Terrorism Expeditionary Medal, Global War on Terrorism Service Medal, Humanitarian Service Medal, Armed Forces Reserve Medal with “M” Device and hourglass, Army Overseas Training Ribbon with numeral four, Louisiana Cold War Victory Medal, Louisiana War Cross, Louisiana Emergency Service Ribbon with four bronze fleur-de-lis, Louisiana Longevity Ribbon with four bronze fleur-de-lis, and the Louisiana General Excellence Ribbon with two bronze fleur-de-lis. 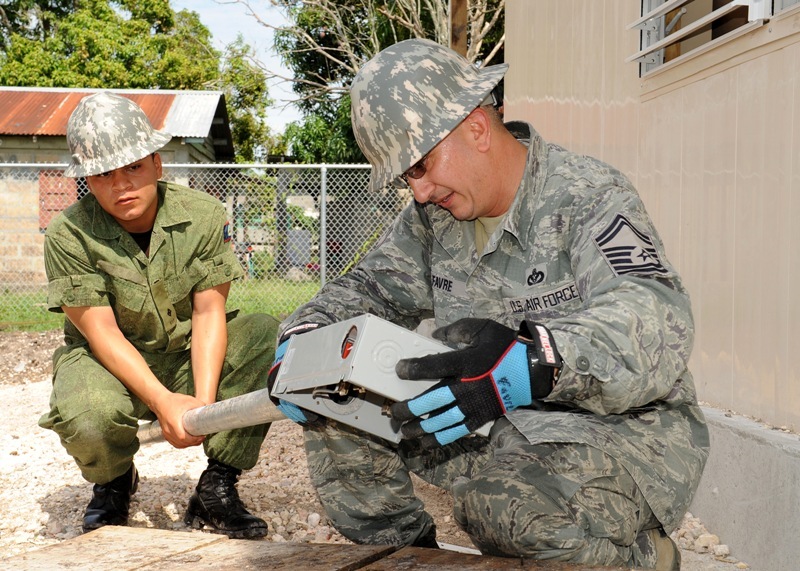 He is also a recipient of the U.S. Army Engineer Regiment Bronze de Fleury Medal. Herndon and his wife, Noel, reside in Prairieville. Together, they have two sons, Chandler and Landon, and one daughter, Aubrey.